Lot Detail - George S. Patton’s 1899 Report Card! 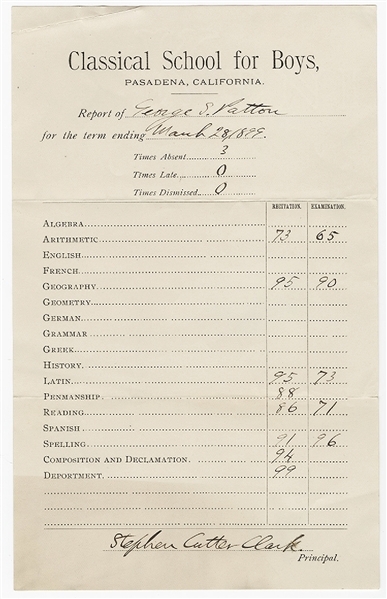 George S. Patton’s 1899 Report Card! Partly Printed Document Signed “Stephen Cutter Clark” as Principal, one page, 5.25” x 8.25”. Completed in manuscript. Crease at upper left blank corner, faint shading in lower left area. Fine condition. Headed “Classical School for Boys / Pasadena, California / Report of George S. Patton / for the term ending March 28, 1899. / Times Absent 3 / Times Late 0 / Times Dismissed 0.” There are two numerical grades for each subject, Recitation / Examination. His grades: Arithmetic 73/65 – Geography 95/90 – Latin 95/73 – Penmanship 88 (Recitation) – Reading 86/71 – Spelling 91/96 – Composition and Declamation 94 (Recitation) – Deportment 99 (Recitation). ... plus, Postmarked envelope from West Point incorporating his signature! Envelope Signed “Geo. S Patton” in the name of the addressee, 5.5” x 3.5”. George Washington 2¢ stamp affixed, postmarked West Point, December 1906; San Gabriel, December 29, 1906 postmark on verso. Addressed by Patton to his mother, “Mrs. Geo. S Patton / San Gabriel / Los Angeles Co. / Cal.” Slit open at top edge. Fine condition.